In just under 6 weeks we will be running the inaugural “Agile Africa” Conference. Registrations opened today (details here) and social media started buzzing with questions and comments. Why no African keynote speakers? Why no women? Why so expensive? While all of these comments are important and valid (and deserve a response), I got to thinking about something quite different – How did the great annual conferences in the world get started? We’ve all heard about ICSE (35 years old) or OOPSLA – now called SPLASH (28 years old) and others. How did the first ICSE or OOPSLA happen and how has the momentum been maintained? In both cases some group or some individual had a vision or identified a need and was able to create something significant from nothing. This has been our challenge in creating Agile Africa – creating something from nothing. The first attempt at running this conference was in 2012 when someone called Joel (I haven’t met him) decided that Africa needed an annual Agile conference. He gathered some people around him, lined up a great programme of international speakers, attracted a few sponsors, and then – nothing happened. Late in 2012, when Joel had dropped the idea, Rolf Russell from ThoughtWorks asked me if the JCSE would be willing to get involved in making Agile Africa happen in 2013. I agreed to provide some sponsorship and commit some time. We then pulled together a small group of volunteers. The problem, however, is that a loosely coupled band of busy volunteers is not the appropriate structure to organise a major conference. Progress was painfully slow. Decisions weren’t being made. There was no legal entity that “owned” the conference. There was no cash in the bank to cover deposits and initial expenses. 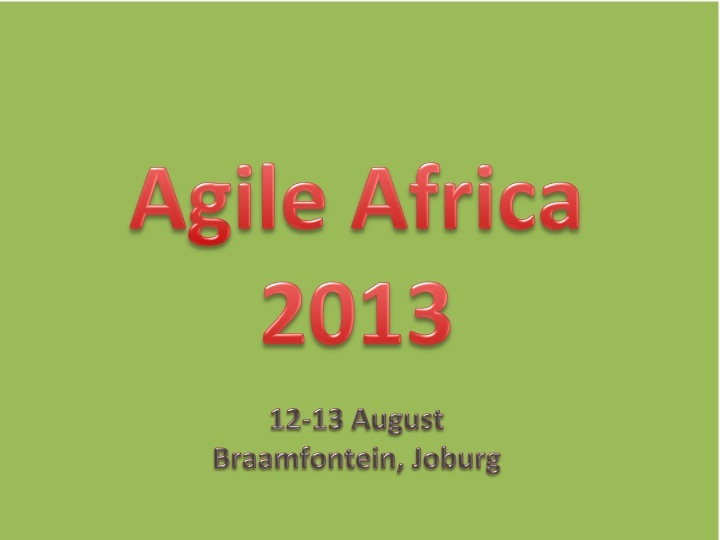 It started to look like Agile Africa 2013 was going the way that the 2012 attempt had gone. Very late in the day I decided to have the JCSE take ownership (or at least custodianship) of the Conference. This solved some of the problems. We now have a legal entity, some full-time organisational capacity and some seed funding. In organising events in the past I’ve learnt that the key ingredient in getting a conference off the ground (at least in South Africa) is to have “big name” keynote speakers. The big names attract sponsors and encourage participation. However, they also push up the costs and increase the risks. I’m proud of the group of keynote speakers we’ve been able to pull together – most of them on very short notice. ThoughtWorks will be bringing Martin Fowler (who needs no introduction to anyone in the Agile Community). I’ve persuaded Ivar Jacobson (another software engineering “rock star”) to speak. I have also secured Amr Noaman Abdel-Hamid who will be coming from Egypt. He is one of the drivers of Egypt’s “GoAgile” programme, and has been hugely influential in bringing Agile development to Egypt and the Middle East. David Hussman and Mitch Lacey are both from the USA and have delivered highly-rated keynotes at Agile gatherings around the world. All-in-all a wonderful line-up! The rest of the programme will be filled with great presentations from Agile practitioners from South Africa and Africa. And yet … what we have managed to set up so far is far from perfect. My good friend Aslam Khan asked in his blog a few days ago, why we didn’t have an African Keynote speaker (although he did acknowledge that Amr is from Africa). I share Aslam’s sentiments in his very thought-provoking blog. The problem, however, is that an extremely good, but relatively unknown, African keynote speaker is unlikely to draw the sponsors and the delegates to an unknown conference. I believe that we have to first build the Agile Africa brand. We need to run it for a year or two, get good participation, provide great value to all involved, and then work on bringing out the African-ness of the local Agile community. Developing Agile Africa into a great Conference is going to take time, and its going to need ongoing support and significant contributions from the continent’s Agile community. In the meantime, I appeal to the community to give their support to our brave but imperfect efforts to create something great from nothing. 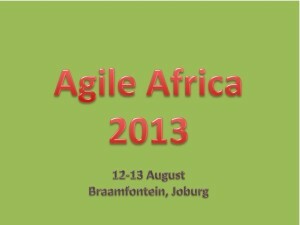 Support Agile Africa 2013 so we can lay the foundations for a bigger and better conference in 2014.